You are here: Home / Deals and Discounts / Top 7 Tips for Getting Wedding Invitations Cheap. Plus One Idea to Avoid. The days of old, when your only wedding stationery option was ordering as a pricey, matched set, are long gone. Today’s couples have a wide range of choices, from simple wedding cards to elaborate suites. And you can do many of these for much less. Here are some of those options. You’ve likely already thought, “Sending emails or Facebook invitations is the cheapest.” And you are right. The benefits are obvious; lower cost, no postage, and you save time by not addressing envelopes. But the perils of doing so are real. If even one invitation goes unnoticed you will be in a heap of hurt-feelings trouble. Some people do not have email or Facebook. Others forget to check their inboxes. And you are sure to have a few friends who get so many messages they are too overwhelmed to see them all. Then there are errant spam filters to consider. Don’t forget service providers sometimes hiccup and don’t deliver. Put these together and the potential for disaster is high. You can save the stress and heartache of digital invites and still get by relatively cheap. Here are some ideas. Note: As with most links on MyOnlineWeddingHelp.com, the links in this post go to this site’s shop section or to a merchant website. My Online Wedding Help will receive a small commission from the merchant if you click and buy a product. Saving on Save-the-Date Cards. Keep it Simple. 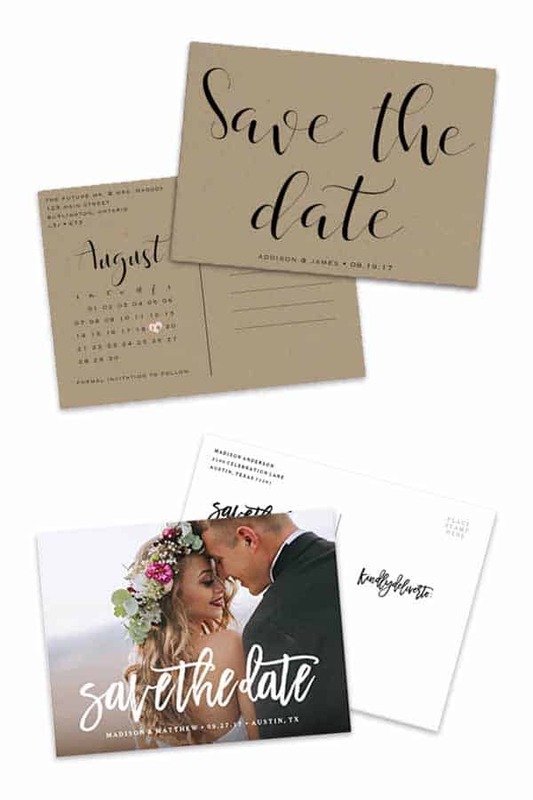 Even couples on very tight budgets often choose to send save the date cards. Who isn’t eager to immediately tell everyone to block out your wedding date? And, because you send these reminders so far ahead of the wedding, it almost feels as if they are not part of the budget. While there are choices that cost as much as the invitations themselves, you can spread the word for less. 1. Send-save-the-dates to only your closest friends and family. The rest of the guests can receive invitations only. 2. Send save-the-date postcards instead of cards. These simple wedding cards cost less to buy and need less postage than full-blown cards. Not to mention no stuffing and licking involved! 3. Speaking of stamps, hand-deliver save-the-date cards and invitations to locals to spend less. And people will appreciate the personal attention. In the technical sense, most invites ordered online are DIY. You often set up the wording and may upload your own images. If you want to go true DIY by personalizing and assembling your own invitations, you can do that as well. 5. Order digital template files online and print them at home or at a local printer. This approach is a bit of both worlds. You can buy a template for a few dollars and download it immediately to get started. Both Sarah and Rebecca, mentioned below, offer this alternative. If you want a large selection of wedding invitations to consider, but worry varieties are limited, you needn’t fret. There are more choices than ever. 6. The most inexpensive is generally Zazzle if you are looking for simple wedding cards. There you can find thousands of designs by independent artists. You’ll generally pay one to two dollars per card. And more often than not you can find a coupon code advertised on the site for a percent off your order. Some styles are part of a suite. In those cases, you can add table numbers, tags, inserts, and other printed materials. Go to MyOnlineWeddingHelp.com/zazzle-invites to see their wedding invitations. 7. Etsy is another good place to find invitation collections. Well-established artisans sell custom, made-to-order invitation collections they’ve made themselves. Here are two you should check out. Both ladies have five out of five-star ratings after thousands of sales.